Teknotherm Refrigeration has built a strong presence in the offshore oil industry. We provide service, parts and upgrades for refrigeration and HVAC systems on board drilling rigs and supply vessels. Our service engineers have all of the necessary safety training as well as the knowledge base to solve any problem you may experience with your refrigeration or HVAC systems. From our roots in Norway to our main office and fabrication shop in Seattle, we’ve been doing this for a long time. Contact us for service or any upgrade you may need for your oil rig or support vessel – we stand ready to serve you 24 hours a day, 7 days a week. Some of our customers include Transocean, Seadrill Americas and Atwood Oceanics. 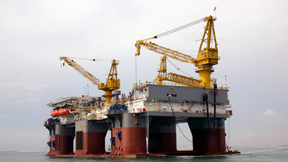 Teknotherm Refrigeration has been specializing in offshore oil rig parts and service for decades. From our roots in the North Sea to the Gulf of Mexico, Pacific Northwest, and Alaskan waters, we have the parts and experience to solve your problem fast. Our parts department can help you source any spare parts you may need, including valves, compressors, condensers, PLC parts (Siemens, Allen Bradley or Telemecanique), chillers and much more. Visit our parts page or call us at 1-800-782-1997 for more information.